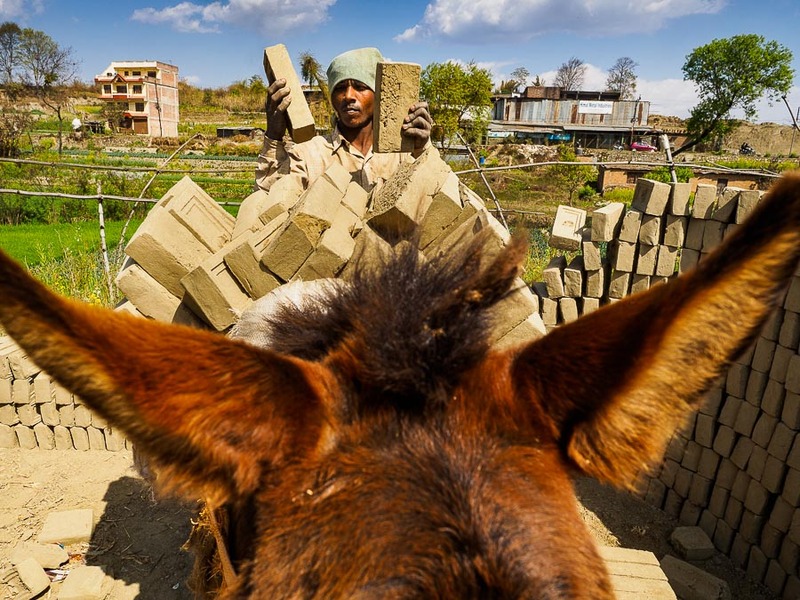 A worker at a brick factory near Bhaktapur carries a load of unbaked bricks to a kiln (smokestack in the background) for baking. 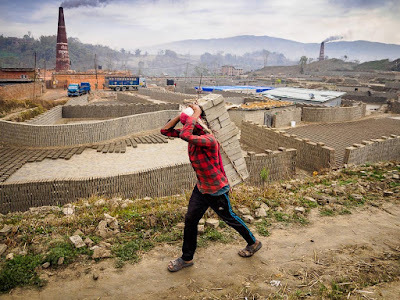 I photographed the brick factories in Bhaktapur as a part of my work on the aftermath of the Nepal earthquake. The brick factories just outside of town and dominate a small valley off the highway. These bricks are made the old fashioned way. The way bricks have been made since bricks were invented. Clay is formed into bricks by hand, dried in the sun then baked in wood or coal fired kilns for a week. The kilns belch thick black smoke into the air. Carrying bricks to the kiln. This is hard, backbreaking work. The footpaths workers take to the kiln are slick and slippery. The walk to the kiln is hundreds of meters each way. And because the paths are uneven with large elevation changes, wheelbarrows or mechanization seems to be impractical. The factories a large source of employment for Nepalese people and they draw migrant workers from southern and eastern Nepal to the Kathmandu valley. 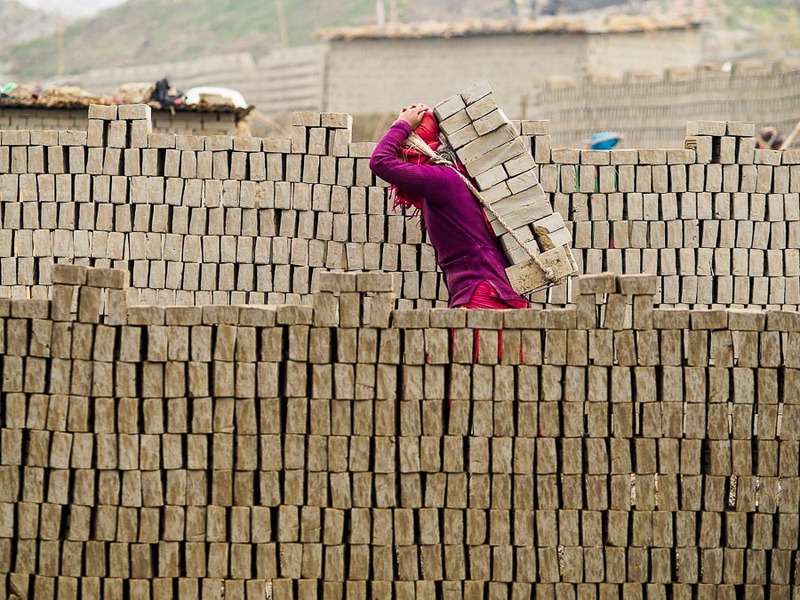 Workers stack unbaked bricks before carrying them to the kiln. Many of the brick factories were damaged and closed after the 2015 earthquake. I visited the brick factories then and none of them were open. 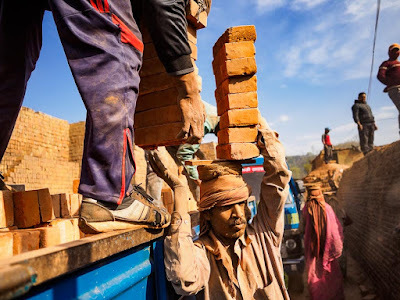 But rebuilding Nepal requires bricks and the brick factories were quickly rebuilt to provide a burgeoning construction industry with materials. Inside a kiln. Unbaked bricks (gray in the background) are stacked up while baked bricks (red foreground) are taken straight to waiting trucks. The bricks are sold to construction firms literally as soon as they are finished. 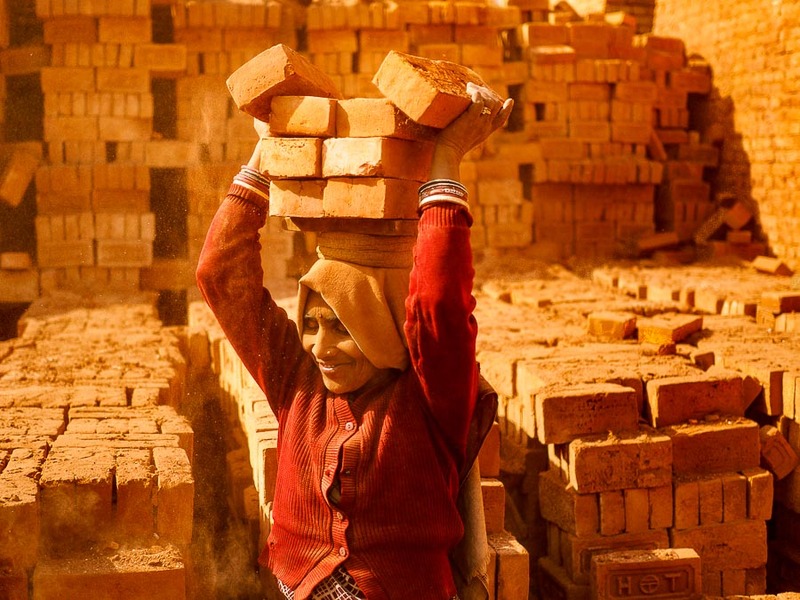 A woman in the kiln stacks bricks on her head to carry to a waiting truck. Again, all done by hand with no sign of even a wheelbarrow. Many of the workers in the brick factories are women. 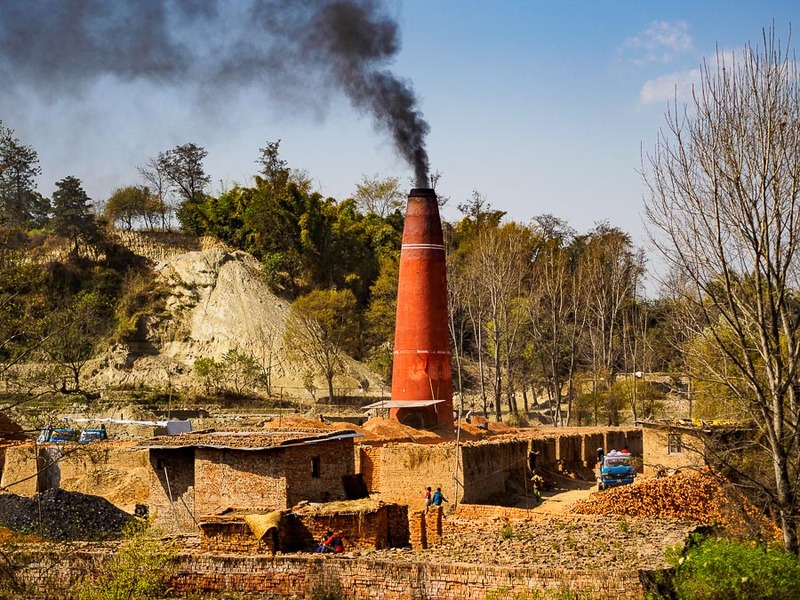 Although Nepal needs the bricks to rebuild and the brick factories to make those bricks, the factories take an environmental toll. Many burn soft coal, imported from India, and they belch noxious black smoke all day long. 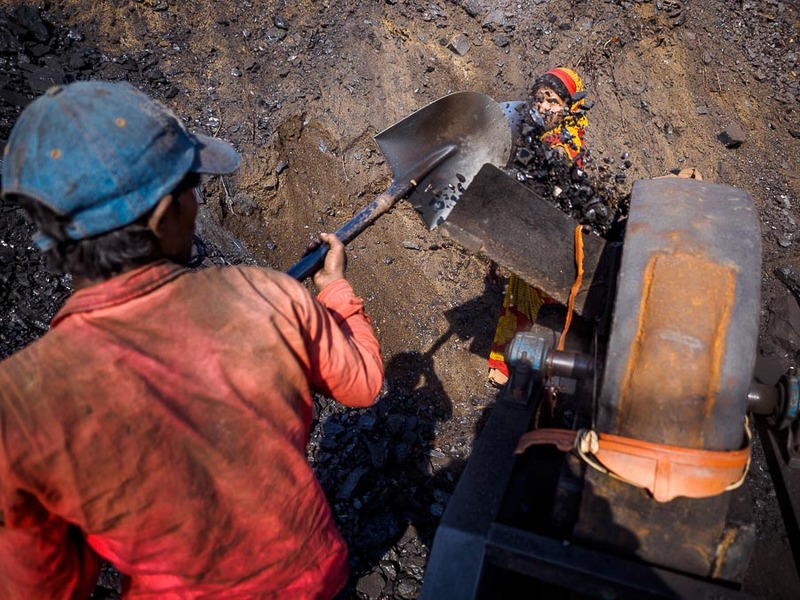 A woman, working with her husband, put pieces of coal into a grinder to make coal dust. The coal dust is then fed into the kiln as fuel. 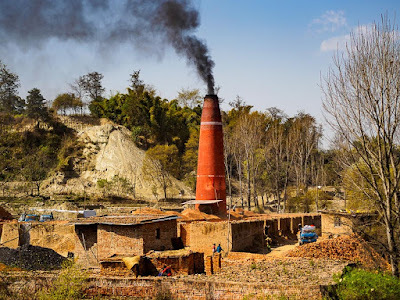 Black smoke coming out of the kiln at one of the smaller brick factories. I've often observed that one of the things I like about being a photojournalist is that I get to see how things are made. 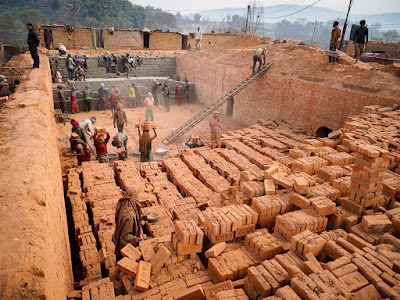 That is certainly true of the brick factories. 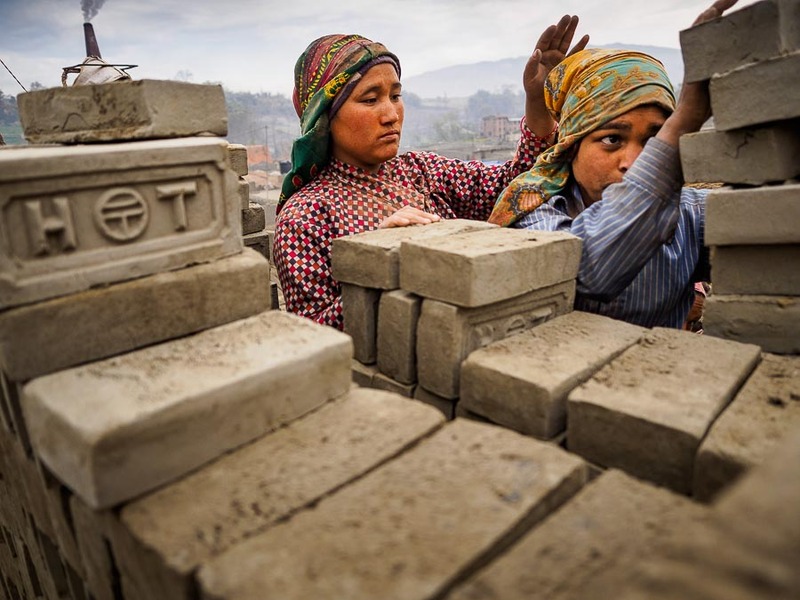 It's fascinating to see how something so commonplace, at least in Nepal, is made. It was like stepping into a time machine and going back 200 years. 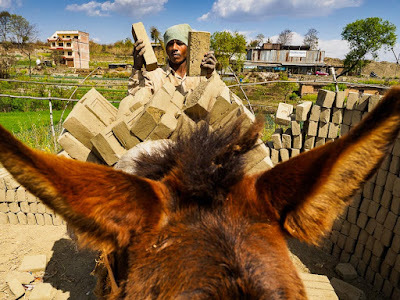 The one brick factory I saw that didn't use human power to haul unbaked bricks used donkeys. This was about a kilometer from a narrow country road and we had to walk through rice and wheat fields to get out to it. A worker delivers finished bricks straight from the kiln to waiting trucks and the bricks are hauled to construction sites around the Kathmandu valley. The red color is not "photoshopped" in. Everything in and around the kiln is covered in thick red dust from the baked bricks. There are more photos from the brick factories in my archive or available from ZUMA Press.